Microsoft revealed during an online Q&A on Wednesday that new peripherals are in the works for Surface tablets, hinting that charging accessories are on the horizon. Microsoft General Manager Panos Panay led the ask-me-anything session on Reddit, the self-proclaimed "front page of the internet," with the Surface Pro engineering team on hand to answer questions as well. Panay responded to a question about new connectors found on the Surface Pro's bottom dock in first person, writing, "Wow - I'm pumped you caught that!" "We haven't announced what they are for but they aren't an accident!" he continued. "At launch we talked about the 'accessory spine' and hinted at future peripherals that can click in and do more. Those connectors look like can [sic] carry more current than the pogo pins, don't they?" "That would require extending the design of the accessory spine to include some way to transfer higher current between the peripheral and the main battery," wrote the Reddit account named SurfaceTeam. "Which we did…"
Well that's pretty blatant. So when can we expect an official Microsoft charging dock for the Surface Pro? Hold your horses - the Surface team ruled that out. "We don't have a dock in the plans, but there are USB3.0HUBS that offer viable solutions," they wrote. So while Microsoft apparently does not have a new charging dock in the works for the Surface, other types of tablet-charging peripherals are likely on the docket. Charging keyboard covers and portable external batteries were mentioned by Redditors, and the Surface team didn't rule those out specifically. But they did manage to remain admirably vague despite confirming that the Surface Pro's enhanced bottom connector is capable of transmitting more current than the Surface RT's could. So far no Surface peripherals take advantage of that, but we're guessing that's going to change soon. TechRadar asked Microsoft for further clarification of the statements made during the AMA, but a company spokesperson told us simply to "take a thorough read" and left it at that. 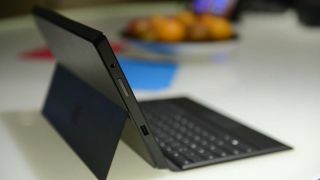 The team also addressed users' concerns with the Surface tablet's battery life and storage. On the Surface Pro's battery life, they went on the defensive: "This product is optimized in every way to take advantage of the full third generation Core i5 it runs, yet give the best battery life," SurfaceTeam wrote. "If you compare it to say a MacBook Air, you will quickly see that pound for pound in battery size vs battery life, you will find optimizations that puts Surface best in its class." "That said," the team continued, "we picked a smaller battery to be sure we were able to give you the same performance and to keep it thin." Regarding storage: "We designed Surface Pro (and the allocation of disk space on our systems) to have the power of full Windows 8, the ability to have a simplified and fast upgrade to full Office and the confidence of a recovery image already available on your device." The team described the multiple ways the Surface's storage can be extended, including via microSD, USB drives and Microsoft SkyDrive. And they clarified that reports in January of the OS taking up around 40GB were exaggerated - though only slightly, by about six or 7GB. Finally, the team addressed why the hefty Windows 8 recovery image is included by default: "Ideally, you will never need your recovery image," they wrote, "however this is a choice we would prefer the customer to make vs having the customer need the recovery image not realizing they needed to create one themselves."